This device is well known for it's ability to make good coffee just about anywhere and is a great tool for beginners to the hand brewed persuasion. It is reasonably small, comes with a carrying case, and also only requires hot water and ground coffee to brew a strong cup. You can also purchase permanent filters to make the tools needed to brew minimal. 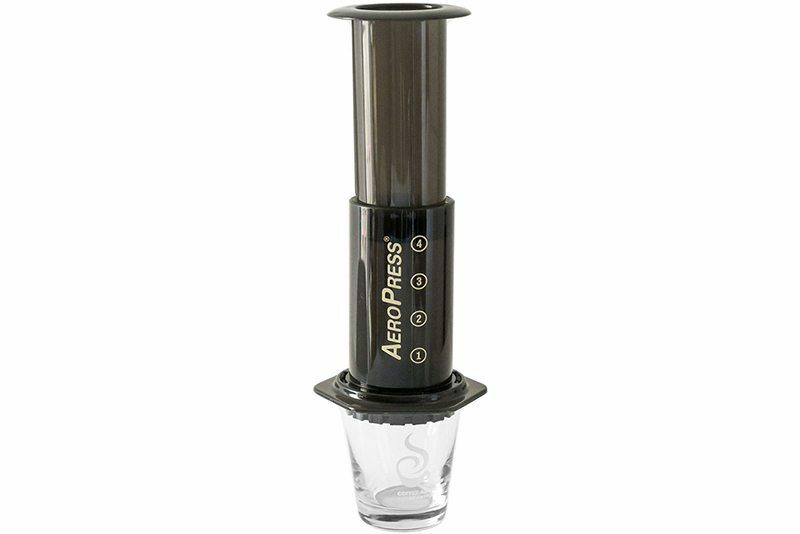 Enjoy a clean, low acidity cup with the Aeropress while at your hotel or even camping. This is a combination immersion and drip coffee brewer that allows you to steep the grounds and then filter them through the drip device when you are ready for a clean, non-gritty cup. It is great for travelling because the system fits over most coffee mugs or cups. You will have to bring filters, but if you are only going to be gone for a few days they don't take up too much space. There are many different versions of the pour over set up, but the lightweight clever dripper is a great choice as you pour the water in all at once and don't have to use a gooseneck kettle for more precision. 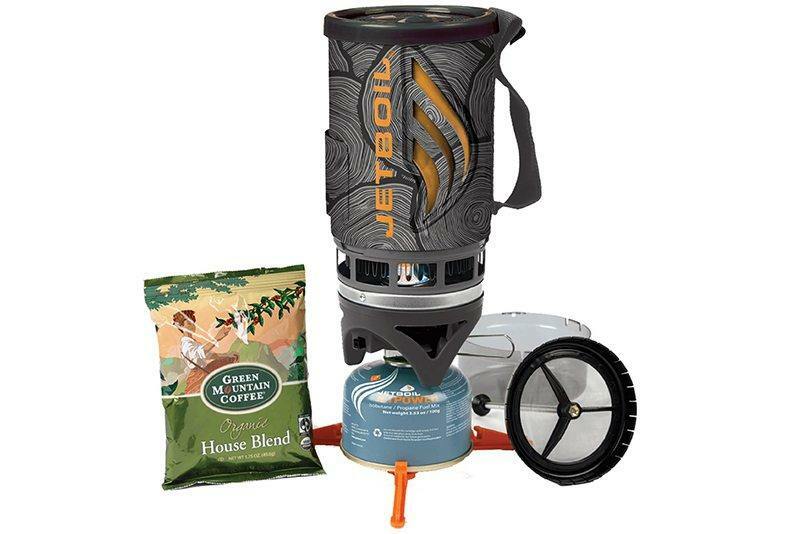 If you are actually camping when you travel, try using the popular Jet Boil system, which is very pack-friendly and lightweight. You can use this device to not only boil water, but also make your coffee. This handy value kit comes with a press and even a pack of ground coffee to get you started. Jet Boil is a system that takes out the guesswork when it comes to using a portable propane/butane stove. It clicks on to the fuel canister for even, efficient heating and also has a neoprene sleeve to keep contents warm. Best of all it tells you when it is hot with a strip of color changing material on the sleeve. Enjoy the multi-function of this system so you can quickly prepare french press coffee or other food so you can get back to relishing the great outdoors. For those that love espresso and aren't into the whole hand brewed obsession, you can still have your espresso on the road, in a tent, or on a boat! 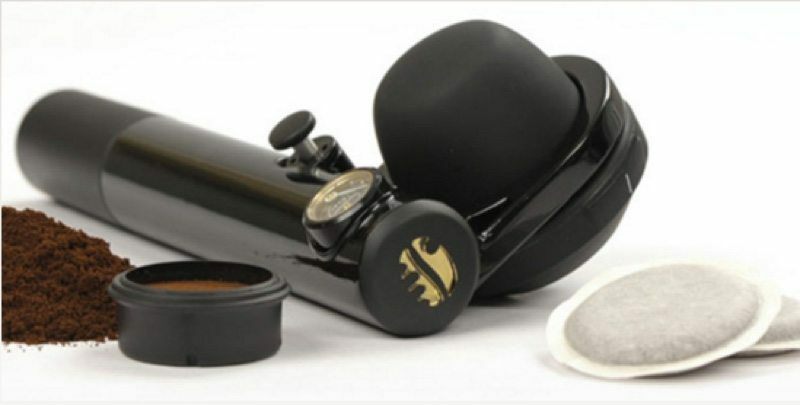 This hand pump (similar to a bicycle pump for filling tires) manual espresso device is a petite and convenient way to make fresh espresso wherever you find yourself. They make a host of different associated accessories for this little espresso pump that even comes in four different colors. All you need is ground espresso or a compostable pod to make the magic happen. For the whole shebang, check out the voyager kit that is assembled by Stumptown Coffee. It has everything you need to get you going in the morning whether you are camping near your car or deep in the woods. 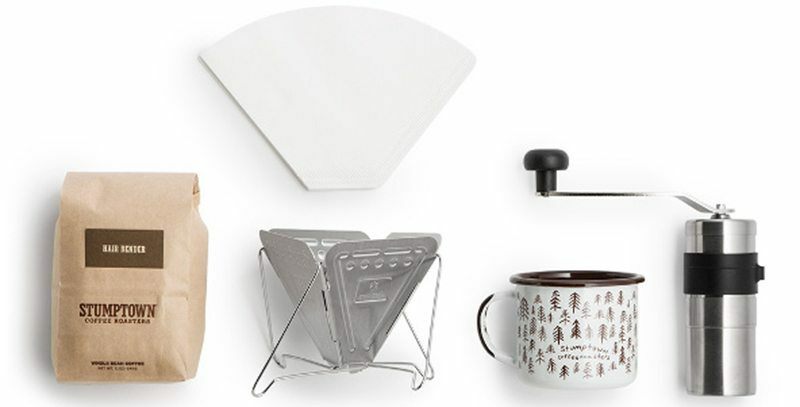 It comes with a super lightweight snow peak stainless steel folding pourover device, an enamel camp mug, a hand burr grinder, and even a bag of coffee so you can have the essentials while you are on your grand adventure. Since they are bundled together, you get a bit of a deal with this coffee making kit. All you need is your camp stove and boiling water. 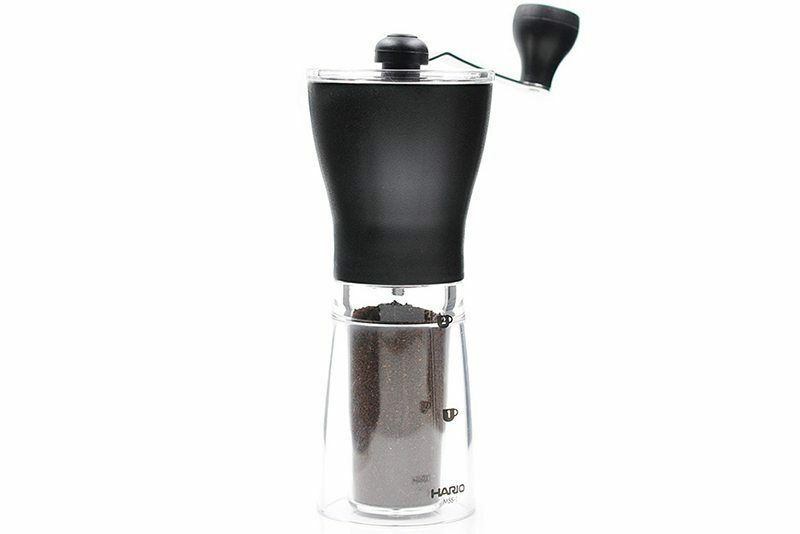 This little grinder is an accessory to the brew method of your choice and since we've listed several different brew systems that benefit from freshly ground coffee, why not include a great way to do it while travelling? 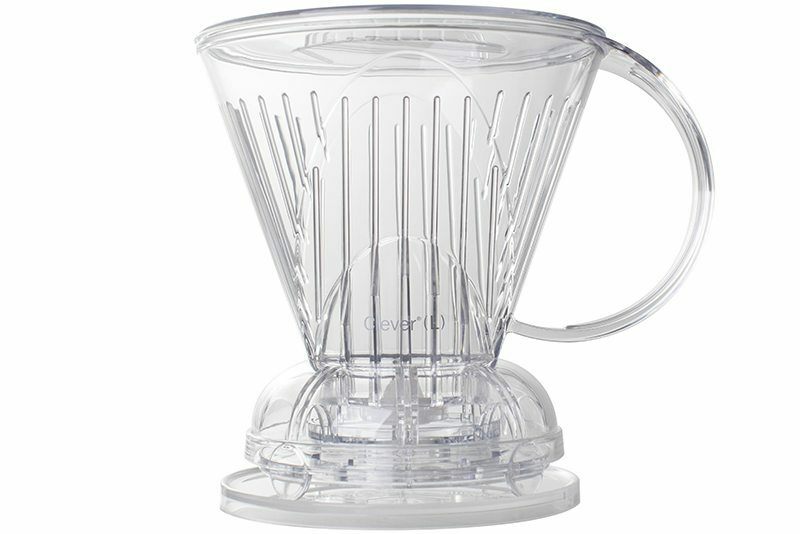 Hario makes a regular sized and a mini skerton so you can hand grind coffee without the hassle of needing electricity. It is quite a workout compared to the electric grinders out there, but when you need your coffee routine to continue in the wild, this guy has your back. Both are high quality burr grinders, which means that our coffee will be ground uniformly and with precision of particle size. If this is an important factor in your hand brew preparation, trust us on this one that the Hario is a great choice at a reasonable price.